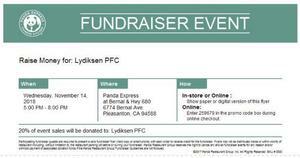 November 14 at Panda on Bernal Avenue. The Lydiksen Book Fair begins on 10/22 after school and runs through the 26th. The big Finale is Friday night, 10/26, before Movie Night. Please visit the E-connection sign up page to sign up for the Lydiksen newsletter and any other school's newsletter that your student (s) attend. Girl Scout Troop #33265 put together a traffic safety video as part of their Bronze Star Award.